Machu Picchu was discovered in 1911. Since then it is one of the best tourist destinations in the world. In 2007 it was chosen as one of the new wonders of the modern world. However, within all this popularity, few people have heard of the ‘mountain Putucusi’, also known as: the hidden gem of Machu Picchu. What is the Putucusi mountain? How high is the Putucusi? What to do in the Putucusi mountain? What is the difficulty of the Putucusi mountain? How are the trails up to the top of Putucusi Mountain? How are the views from the top of the Putucusi mountain? Who can climb the Putucusi mountain? What will I need to climb the Putucusi mountain? 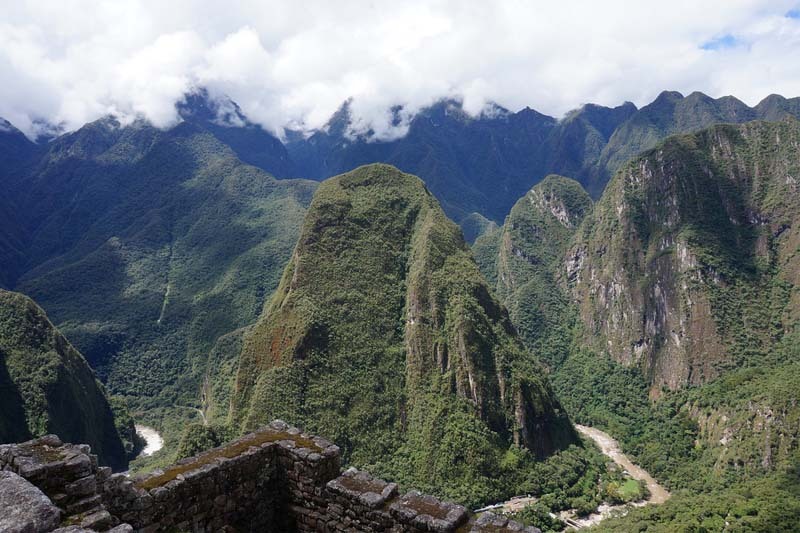 Do you want to tour the Putucusi mountain in Machu Picchu? Do I need a guide to climb the Putucusi? Putucusi ‘Happy Mountain’ is one of the mountains that surrounds Machu Picchu. It is 2,560 meters (8,500 feet). Its roads are steep. However, once at the top you can appreciate all the beauty of the landscape surrounding the Wonder of the World. 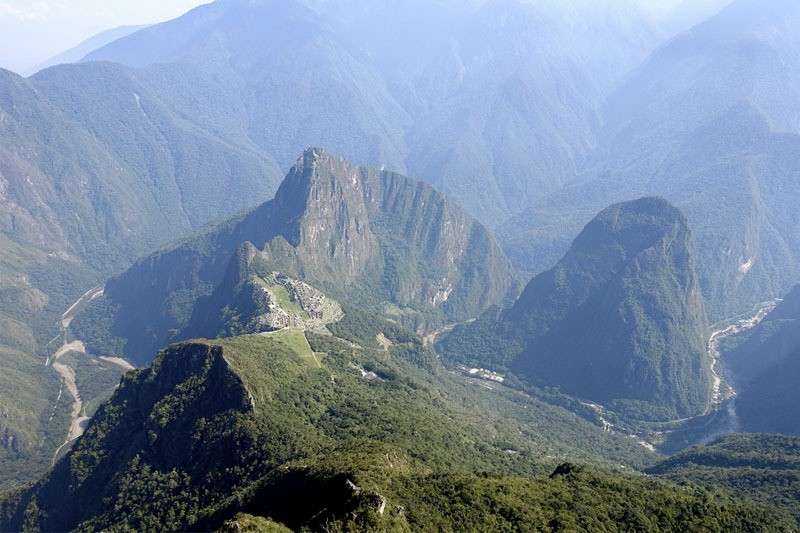 The Putucusi mountain is one of the hidden gems of Machu Picchu because very few people have visited it. This mountain is as impressive as the hikes that offer the Huayna Picchu or the Machu Picchu mountain. Putucusi is the smallest of the 3 mountains (Machu Picchu Mountain and Huayna Picchu) that make up the place where the Inca City was built. Its highest point reaches 2,560 meters above sea level (8,500 feet). Putucusi is a Quechua word meaning ‘happy mountain’. In addition to its name, the structure of its round shaped beak attracts attention. The Putucusi mountain is on the opposite (northeast) side of the Urubamba River, just in front of Machu Picchu, in the department of Cusco in Peru. It is located in the town of Aguas Calientes. A short distance from the train track that leads to the city of Cusco. 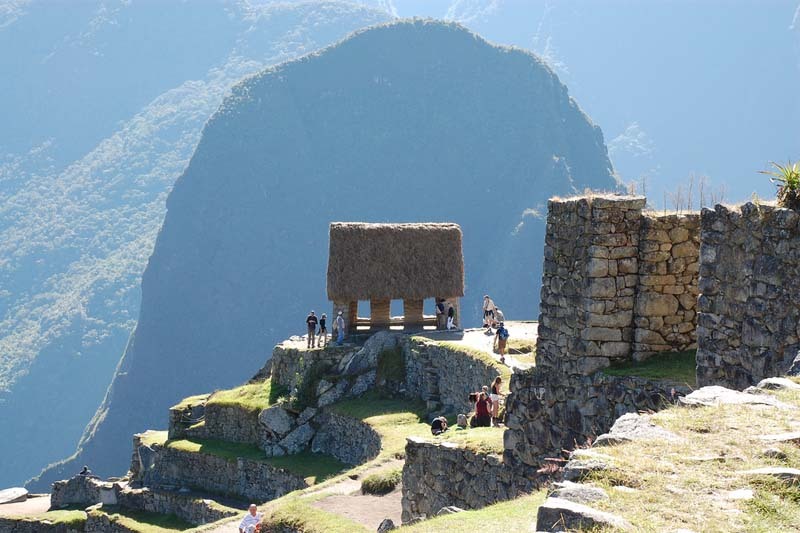 No Inca structures were found on the Putucusi mountain. The main tourist attraction is the incredible hiking trail to its top. Along the road that leads to the top of the mountain, there are many species of birds, insects and, above all, abundant flora such as: pisonaes, alders, ferns and around a hundred species of orchids. Once at the top, tourists can appreciate the Inca City of Machu Picchu in the distance. You can also see the Urubamba river valley, the Huayna Picchu mountain, the town of Aguas Calientes and more. Climbing the Putucusi costs nothing. You just have to have enough strength and skill to climb the difficult stretches of the mountain. 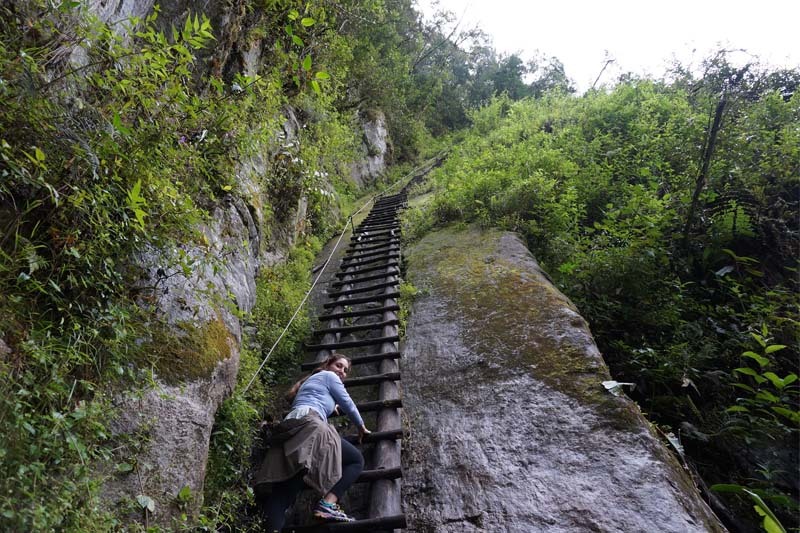 You can get there by walking from the town of Aguas Calientes. Climbing the Putucusi mountain has a challenging difficulty. Without a doubt, it is a more complicated adventure than climbing the Huayna Picchu or the Machu Picchu mountain. You enter the mountain from the town of Aguas Calientes. It is advisable to make the tour of this mountain in the company of a person who knows the route. The trails and vegetation could make you lose. Getting to the top of Putucusi is not easy. The tour lasts around 4 hours. The road starts from the village of Aguas Calientes (Machu Picchu village). From there you only have to follow the train route in the direction of ‘Hidroeléctrica’. After approximately 10 minutes of walking, there is a sign indicating the detour to the Putucusi mountain. At once you will have to climb some stone stairs. The road is traced by the steps of previous walkers. Then you will reach the most difficult point of the route. You will have to climb the side of a mountain holding on to a metal rope. As you move forward you will see some wooden stairs available to overcome this rather steep stretch. After overcoming this obstacle, the path continues along less steep paths until it reaches its peak. The views from the Putucusi mountain are incredible. You can see the surroundings of Machu Picchu: the river that winds around it and the whole valley from outside. From this point it is also possible to see how the Andean mountain range limits with the spectacular forests of the high forest of the Amazon. Climbing the Putucusi mountain will require strength and skill due to the steepness of its trails. Admission is free and you do not need to buy a ticket. However, this adventure is not recommended for children and seniors. Unlike Machu Picchu, you should not climb the Putucusi mountain during the rains. This is because the sections are slippery. In addition there are gorges on the side of the road. In 2011, the constant rains ended with a section of the wooden stairs that lead to the Putucusi. Therefore it is currently impossible to travel the mountain without the proper equipment. Jacket or poncho for the rain. Putucusi is an adventure not recommended during the rainy season. The best time to visit is during sunny days. While you do not need the company of a guide, visitors should take their precautions during the ascent: this summit can be dangerous. The mountain Putucusi does not need the purchase of an entrance ticket. To visit this summit you should only walk from the town of Aguas Calientes. The rainy season in Cusco and Machu Picchu runs from November to March. It is not recommended to visit the Putucusi mountain during those days. The dry season (from April to October) is the best time to visit Putucusi. The days are sunny and there is no chance of rain. You do not need the company of a tour guide to climb the Putucusi mountain. It is advisable to go accompanied to the mountain Putucusi. In addition you should be advised by a local person who knows the route. If the necessary precautions are not taken, visiting the Putucusi mountain can be a dangerous adventure. The main risk is not finding the right path and getting lost in the steep mountain trails. In addition, climbing the rope that leads to the wooden stairs is very difficult. Tourists must climb taking all the necessary precautions. Otherwise, the fall may cause damage to the visitor. The visit to the Putucusi mountain is not recommended to the public. This is due to accidents that can cause climbing their steep trails. Despite this, many tourists still visit Putucusi. It takes strength and skill to overcome the difficult pitfalls of this summit. Currently entry to Putucusi is free. However, after adapting the mountain for tourism, this may change.